If there is any consolation at summer's end, when we have to leave turtles and Hawaii, it is knowing that another week of diving would have done us in. We are presently three dives shy of our magic 120 dive goal for the summer and we are bone-deep exhausted. Still, it is the kind of exhausted that means we have no regrets and spent maximum time underwater. In our Week 2 Summary, we described in detail our first observation of sea turtle copulation. This week, in exactly the same location, the same male linked up with another female. The entire event was recorded on videotape. Both animals have tumors, unlike the previous copulation in which only the male did. What made this linking stand out was how the lady rid herself of her male suitor when she'd tired of him. With the fiercest flailing of flippers,she managed to pull the pair about 10 feet from the ocean bottom and wobble along completely upside down. 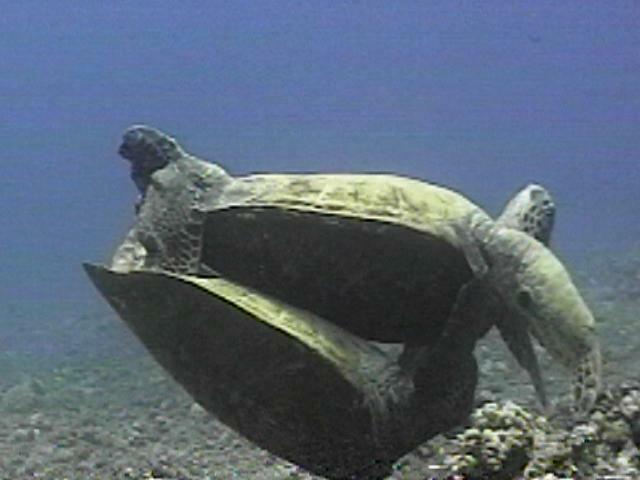 In this position, the female took a few more mighty flipper swipes and drove the male's head right into the coral rubble. The male's large carapace did him no good. She made sure the only portion of his anatomy driven into the ground was his head. His reaction was immediate. He let go. Once released she took off... directly at Peter, who was videotaping. Female swerved, diver jumped and even then the video shows contact. This could have had very serious consequences had there been an all-out collision. We don't like to think about it. The Turtle House has changed considerably since we first discovered it in 1989. 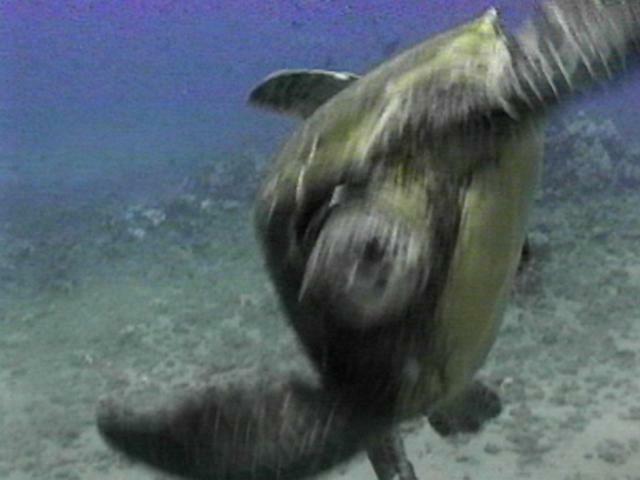 The large coral head projecting at the highest point has been relentlessly ground down by numerous turtles scratching their plastrons on its surface. Turtles don't have to scratch to have their effect, however. The numerous landings have, over the years, crushed the most prominent coral heads to rubble. Since the turtles select one site to do their resting and socializing, this pulverizing is limited to coral and volcanic rock in the immediate area. This week, we observed yet another way that turtles can have their effect on corals. 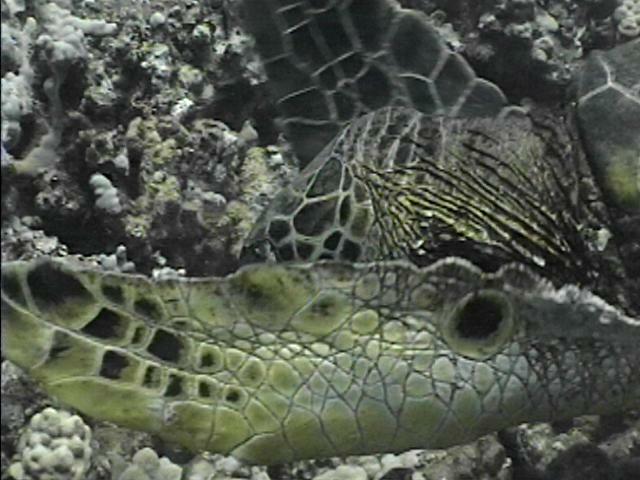 Sometimes, when a turtle lands or scratches she breaks off a section of coral. This exposes whatever might be living on its surface to feeders. Sometimes it is material turtles enjoy eating. Frequently, we have observed turtles scraping at what appear to be yellow or orange sponges growing in crevices between corals. This stuff must be tasty because turtles spend a great deal of time and energy on what appears to be very little organic material. Turtles will spread their flippers and wedge them between corals to get better leverage. Their strong flippers can sometimes break off even more coral, again exposing new material and the process continues. Last week we reported on an old acquaintance. Over our ten month absence, Estrelita sustained shell damage and we weren't sure what we were looking at. We posted a message on CTURTLE and asked for input. The consensus is that Estrelita met with boat and boat won. 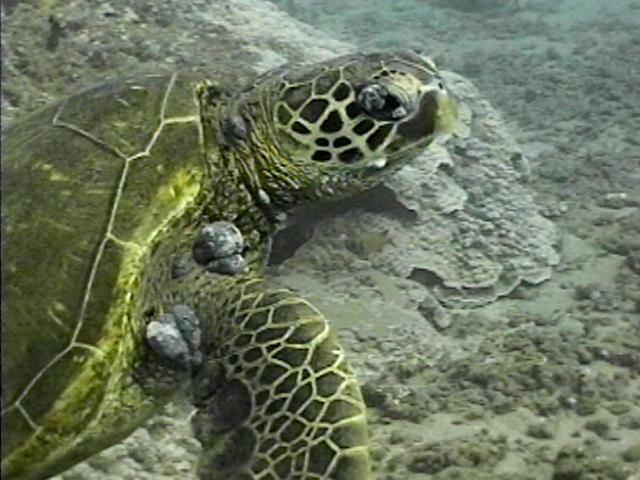 The damage to his shell is consistent with propeller impact. In our Week 3 Summary we reported that we received word from the National Marine Fisheries Service that Tutu had been observed nesting at the French Frigate Shoals. 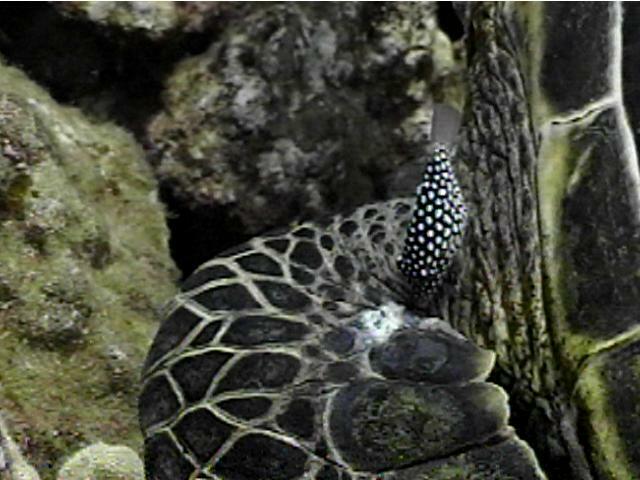 She last nested in 1994, and we sighted her at the Turtle House on August 25th that year. Our last dive for this year will be on the 25th so we hope she is right on schedule, otherwise we will have to wait ten whole months before we know she made the return trip safely. A large and beautiful female, who showed up once before this summer, this week let us get close enough this time to read her tags. She is turtle U 164. We have advised the National Marine Fisheries Service of her sighting and are waiting information on this animal. The role White Spotted Tobies might be playing in the spread of this disease was highlighted for us again this week. Peter followed one toby and videotaped its attention to a small turtle named Hoahele. Hoahele has three obvious tumors. Two are in the posterior corner of both eyes. The other is on her left flipper. The toby would bite at this tumor and the turtle would twitch just enough to scare the fish away. The fish would circle and return from another direction, approach the tumor and bite again. The turtle would twitch, change position, with the toby fleeing only to return to the tumor and bite again. This scenario was played out repeatedly for the five plus minutes of observation time. The toby would leave the tumor just long enough to nip somewhere else on Hoahele's body, usually the throat. So toby went from biting the tumor to biting the turtle's neck. We wonder if this is one way tumors are spread from one location on a turtle to another. We are now down to our last three dives of the summer. We will have completed 120 with a minimum of 60 hours of direct observation at the Turtle House. Our very special Howzit did not turn up, nor do we expect him to in the last three dives. We met Howzit in 1992, when he was new to Honokowai and we were just getting serious about turtles. He was a daily presence every summer after that. In 1994, he developed suspicious white spots. By 1995, he had tumors and an obscenely shrunken plastron, suggesting advanced emaciation. His external tumors could not account for the rapid deterioration he had experienced. We did not expect to see him this year and we didn't. Over the next few months we will write a good-bye tribute to this creature we so loved. The most twisted, hateful mind couldn't invent something as fundamentally evil as Green Turtle Fibropapillomatosis. In the midst of all this sickness it is just impossible to conclude this epidemic is natural. During quiet times we will rest beside old friends and contemplate what they did to deserve all this. The answer could be as simple as being unfortunate enough to have shared this planet with humans.